Students in Hudson Valley Community College's Nursing and Community Health Navigation degrees now have a new option to continue their studies at Maria College after graduation. 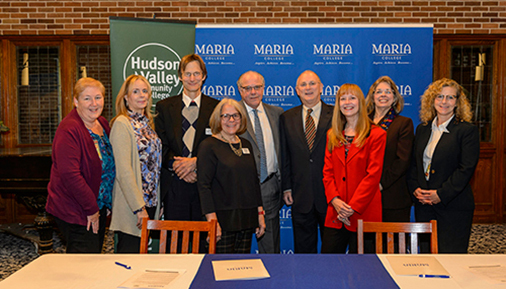 The Troy, NY SUNY community college and Maria College in Albany, today signed an agreement that will provide seamless transfer into Maria's Bachelor of Science (BS) degree in Nursing completion program or the Health Care Management bachelor's degree program. Students who complete either the Nursing or Community Health Navigation associate degree programs at Hudson Valley with a grade point average of 2.5 or greater will be guaranteed admission to Maria College with a third year (junior) status. "We are happy to work in conjunction with Maria College to provide another local option for our health science students to continue their education," said Hudson Valley Community College President Drew Matonak. "The majority of our graduates stay in the Capital Region, so having a transfer partner in Maria increases their opportunities and their chance for further career advancement." Maria College President Tom Gamble stated, "Maria College is proud of its Mercy heritage and deep roots we have in this region of providing rigorous and compassionate healthcare education. Having a baccalaureate degree can be very important to career advancement and we are very pleased to work with Hudson Valley and other educational partners to create new pathways and opportunities for students. Together we are building a strong healthcare infrastructure in the Capital Region." The Nursing associate degree program at Hudson Valley, which has been in existence for more than five decades, annually graduates about 70 students, many of whom wish to continue their education at the baccalaureate level. Maria College provides three entry levels into the nursing profession with a practical nurse certificate program (LPN), associate degree in Nursing (RN) and a bachelor of science degree in Nursing completion program. Hudson Valley and Maria alumni are visible in healthcare leadership positions across the region. Hudson Valley's Community Health Navigation program enrolled its inaugural class this fall. Graduates are prepared to help patients break down the barriers to care and find their way through the sometimes daunting healthcare system by providing help with navigating things like insurance, prescriptions, transportation, and follow-up care. The Maria bachelor's degree in healthcare management program prepares students for mid-level management positions in a variety of healthcare settings. Dr. John Kowal, Maria College Vice President for Academic Affairs stated, "Maria's BS in healthcare management provides a balance among the technological, clinical, and business sides of healthcare. An internship also allows students to work with professional healthcare practitioners to enhance their classroom learning experience and give them a competitive edge when seeking employment." Hudson Valley students or alumni who are interested in finding out more about the transfer agreement can contact the Center for Careers and Transfer. Founded in 1958, Maria College is one of 17 colleges and universities in the United States sponsored by the Sisters of Mercy of the Americas. The private, co-educational, Catholic college in Albany serves almost 800 students in a variety of degree and certificate programs including liberal arts, healthcare management, nursing, occupational therapy assistant, and health and occupational sciences. Maria College prepares students for meaningful careers in healthcare and service so they can make a difference in the lives of others. More information about the college is available at www.mariacollege.edu. More information about the college is available at www.hvcc.edu.